What Will Procter and Gamble Do in 2014? Next year will be a major transition year for Dow Jones component Procter & Gamble, as it seeks to outgrow its rival Unilever. With 2013 now down to its final weeks, investors are starting to plan for the year ahead, looking for stocks to add to their portfolios. Of all the Dow Jones Industrial Average (DJINDICES:^DJI) components, Procter & Gamble (NYSE:PG) might stand out as being one of the most boring -- the maker of consumer staples largely trades in line with the broader market. But 2014 could be a big year for the company, as new management aims to return it to earnings growth. Procter & Gamble's now-former CEO Bob McDonald retired in May, replaced by his predecessor AG Lafley, who came out of retirement to take the position. Lafley, however, doesn't plan to stay for long -- shortly after taking over, he elevated a number of high-ranking executives to run different business groups; one of these will likely be his replacement. While Lafley is unlikely to be P&G's CEO over the long-term, he could stay for a few years, meaning a transition is unlikely to occur in 2014. Nevertheless, investors should look for more clarity in regards to the company's succession plans. Hedge-fund manager Bill Ackman led the drive to get McDonald out, pushing the board to consider alternatives in the wake of P&G's disappointing growth, which has lagged competitors like Unilever (NYSE:UL). Ackman got his wish, and with new management at the helm, he's waiting for results. Ackman's fund, Pershing Square, actually sold much of its P&G position, but replaced it with call options, making his bet on P&G even more aggressive than before. At the Ira Sohn conference in May, Ackman gave a presentation on Procter & Gamble and his expectations for the company going forward. If P&G's new management can execute, Ackman believes the company should be earning $6 per share in 2016. Those earnings, combined with P&G's attractive dividend, incline Ackman to believe that the company is worth $120 per share -- more than a 40% upside. Ackman's 2016 price target is still a few years away, but if investors are expecting it to play out, they should look for organic revenue growth and gross margin improvement. In the past, P&G had promised gross margin improvement, but failed to deliver, while organic revenue growth had lagged Unilever's. 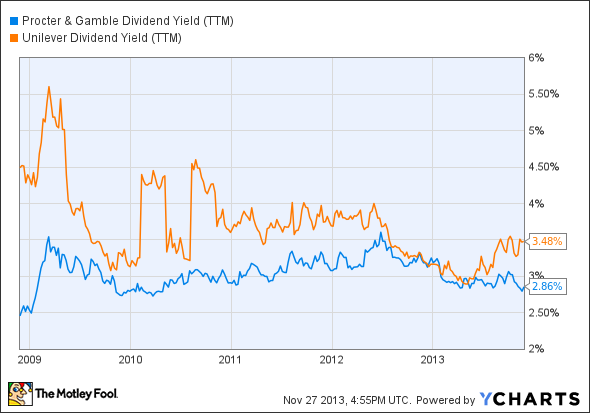 Perhaps the best reason to own P&G is its dividend. With its focus on consumer staples and regular cash payments, P&G appears to be a great stock for an income-focused portfolio. Right now, P&G is yielding about 2.85%, less than Unilever's 3.48%. Procter & Gamble, however, has a 57-year history of increasing its dividend, announcing a 7% increase back in April. Will 2014 be the 58th consecutive year? It's highly likely, and if P&G can execute on its cost-savings plans, it could raise its dividend more than investors expect. Overall, 2014 is setting up to a major transition year for the company, as Lafley aims to reinvigorate P&G, while searching for his long-term successor.